The city is really tense. Walking through the Piazza Navona this afternoon I saw all the branches of police from the Carabinieri (who must have some serious height requirements for admission, amongst others) to the local city polizia carrying truncheons (! ), plus an awful lot of plain clothes cops – who do stand out however much they may think differently. Then we have the helicopters hovering, the riot wagons loaded with gear and a lot of angry looking men. There is a big political rally/protest about to start at any moment and unlike some others I’ve seen, this one seems to have everyones’ teeth on edge. I believe it has something to do with an independence movement for one of the northern provinces, which seems improbable but regardless the authorities are taking it very seriously. There won’t be any photos – as I’ve mentioned before the Carabinieri really take exception to having their pictures taken! So discretion being the better part of valour, I decided I really didn’t need to go shopping and decamped for home! Now that I have you all thinking I’m barricaded in my apartment – on to more tranquil musings. I have been working on a new and very ambitious project. The foyer of my condo – whenever it actually gets built, will be about 2 x 3 metres and I am making a black and white mosaic floor for the entire area. The central cartouche will be “The Dancing Faun”; I saw this statue years ago and immediately fell in love. Google him to see what I’m trying to recreate however poorly. My gorgeous new man, “The Dancing Faun” of Pompeii fame. He will be almost a metre tall, anatomically correct (because people keep asking me if he will be? ), bear in mind that this is the reverse which is always a bit rougher looking. I haven’t yet figured out the surround but it will be a multi year project anyway. 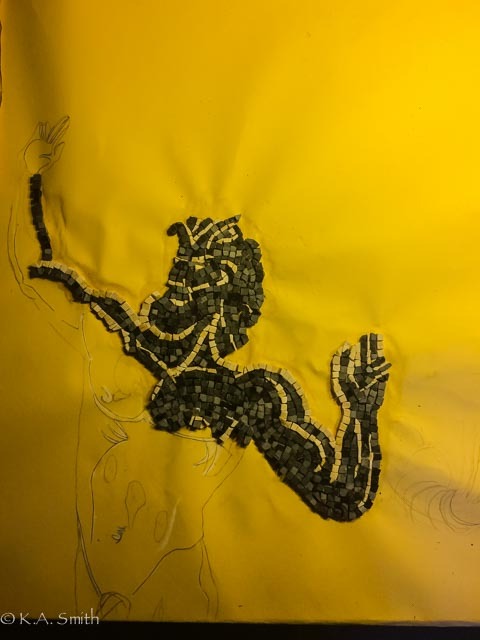 His left arm has been giving me the fidgets – translating a three dimensional statue into a two dimensional drawing and getting it right has meant I’ve laid down and torn up the arm three times before I was happy with it. I figure I will be looking at this fellow for the rest of my life so I’d better get it right, right? 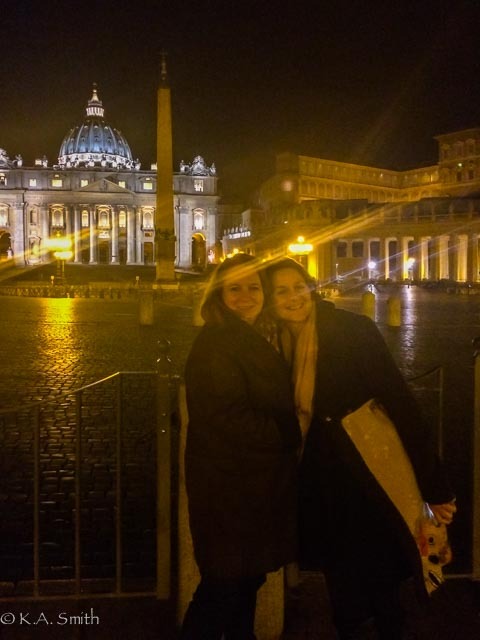 An Indian travel buddy came to visit last weekend and we had one of those seriously late, lots of wine, dinner and nightclub nights which culminated in a tour of the city at 3:30 in the morning! St. Peter’s is quite perfect then. 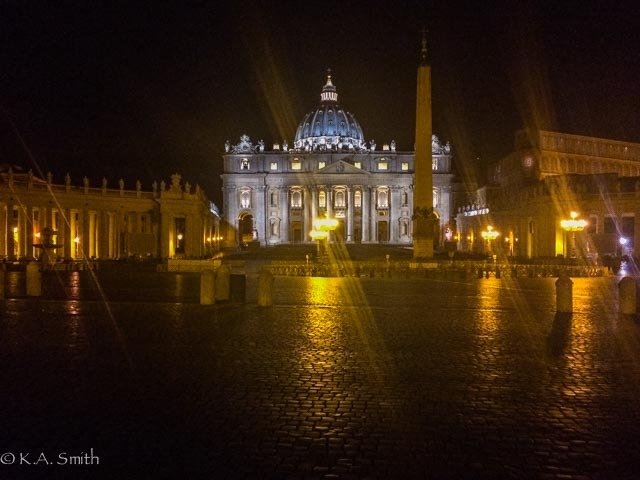 The Vatican at 03:30, stunningly beautiful. Kim and Amanda at the end of a very long evening! I am not entirely sure who is holding up whom here, but we are very happy! We also had the very great pleasure of hearing my sweetie sing at the nightclub – what a gorgeous voice – which he really does hide under a barrel, mores the pity! Looks so beautiful and serene. I miss Rome! it can be deceptive but le romanae take everything in stride – they have had 3000 years of practice! Gorgeous pics as always. 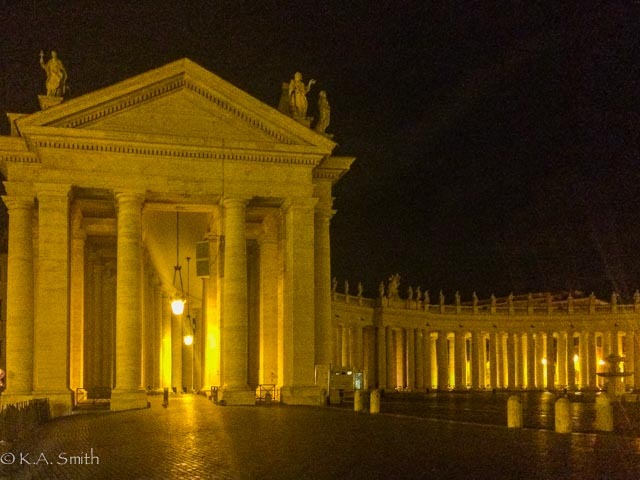 I think I can see the Pope in the window wondering who the two Hot ladies are taking a picture of his house at 3 in the morning….. Sounds like you are yet again taking life and showing it a good time Kim. Warm envy from chilly T.O.